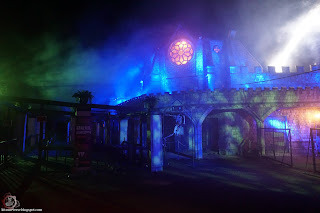 Okay, so it was opening night, and that means it's Hundred Acres Manor time around here. 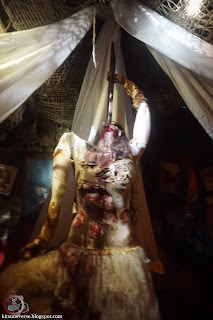 Sure, a few things were definitely a little hinky here and there but have to say that the two time best overall haunt award winner, Hundred Acres Manor, is already in serious contention for it once more. Featuring 6 themed areas, including the new additions of Hallows' Eve and The Breach, along with their two escape room experiences, they just keep adding to the insane legacy that has given this haunt such a reputation over the past 13 years. Not only that, but they've changed up the entire way the outside of the haunt is lit via LUXE Lighting and the results? Completely astounding. The new queue line area and general atmosphere has been totally changed and it's hard to believe just how transformative it is until you see it in person. What the creative team behind Hundred Acres Manor achieves every year is nothing short of amazing, and it's no wonder that they've been rated as one of the best by us (and many others) so consistently. Recommendation: If you haven't been, go. If you have? Go again! Likes: Totally in love with the Hallows' Eve addition for 2016, absolutely incredible. Pro-Tip: To avoid big crowds, go on a Sunday or week night, it's always a great show! 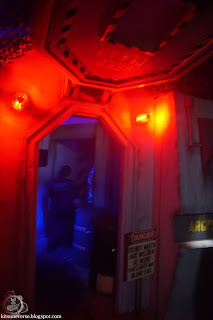 Disclaimer: We were invited out by Hundred Acres Manor and were given tickets, as well as access to some areas that others may not get to see. This, as always, is just so that we can do what we do and give you the best coverage possible. As usual, the journey into the weird and bizarre kicks off before you even get inside. With an all new queue line set up and a few other touches outside, the ever present Hundred Acres Manor soundtrack blaring, you know that you're in for something special right off the line. By the time you get to Deadlift, you'll be wondering just why you're in this hand basket and wondering where they're taking you. Not much has changed here, but as always, the actors sell the experience in a big way. Which, given the nature of this first little taste, isn't the easiest thing to pull off and not many haunts out there even attempt it. I wouldn't want it any other way though, it's just a great way to kick things off. Once released, it's time to head into the oldest section, and spiritual namesake of Hundred Acres Manor...Damnation and the manor that lives within it. Being the longest mostly untouched area, not much has changed here. Don't let that fool you though, the atmosphere is still one of the best out there and is a killer way to get things going early. You'll never know what to expect, or where it's coming from while making way through the twisted confines. There's just so much detail and everything is paced perfectly that it's hard to imagine it not being there. Every year I think that I'll tire of it, or that it needs to be changed up, but that's quickly put to rest by the performances from the actors that keep making it a great and the incredible amount of details that has been layered over the years just add to the immersive experience. I know that one day this will likely change, as all things do, but until then? You don't fix what isn't broken. Think your safe after that? Oh no, it's onto the delightfully twisted and insane Torture Tank. Every time I think of seeing this one I get goosebumps. Why? Well, it's so over the top with it's insanity that it just has to be experienced. Every manner of torture device and situation can be yours...for a price! What's not to like about that, right? Well, the victims obviously aren't huge fans, but what's a little blood spilt between friends? There's a ton of detail going on here, and I just love how everything is incorporated to give it the feel that you're really inside of this twisted little world. Some of it, definitely disturbing but it fits in with the theme perfectly and it just feels lived in. Having been around for a couple of years now, it's something I expect but isn't always realized by many places. 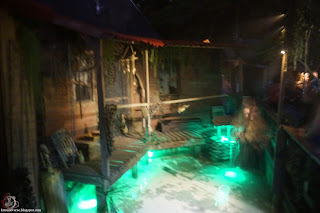 If you've survived the horrors from the tank, you'll next find yourself winding through the caves and cemeteries of Voodou. New back in 2015, this one is a head trip and a half as it takes you through the bayou in the only way that HAM knows how, screaming and trying to cling to sanity. Using the existing features of the old pool that once where the haunt now stands, this part of the attraction really makes a huge splash and just does things that no one else out there does. It's a crazy labyrinth that's parts old and new but meshed together into something terrifyingly wondrous. The finale? Way too much fun and has to be one of my favorite features to be added in the past few years! Now, normally I'd start talking about the maze and how people would try and use Google Maps to navigate thing but this year? That's gone. I'm not totally torn up over this one being scrapped, as it was always something that just seemed slightly out of place, and in my eyes, kind of hurt the flow in past years. Nothing really remains outside of a small little homage and once past that, you'll enter one of 2016's new attractions, The Breach. I'll say it, aliens and me have a weird history that goes deep into my haunt working past and it's not exactly the best memory either. Thankfully, the folks at Hundred Acres have decided to avoid any of those pitfalls and have created something that's eerily similar to things you may know but with enough difference for you to realize that it's nothing like what you're expecting. Making my way through, it was very apparent that something has gone horribly wrong on the deep space research vessel that is home to Project Argos. Navigating the cramped, reality altering, and stark halls, you'll run into the victims and crew members driven completely mad by whatever they've been experimenting on. There's a lot going on here, and while some of it may seem "simple", this is proof that you don't need to pack every inch of space with something to get the effect you're after. This is a different kind of experience and it owns up to that throughout the journey. To be honest, he first time I went through, I have to say that things didn't totally jive with me on this one. A few areas seemed a little too quiet and stark. However, the second time, things were going a bit more full steam and with the fog settling in a bit more, the true nature of the beast was realized. The fact that it did take two passes though to really appreciate it wasn't totally lost on me though, and kind of a little bit of a worry there. However, this was only the first night, so there's tons of room for improvements and tweaks. Seeing as how I always go back for a second visit, I'll be curious to see how it evolves over the season. Now then, last and certainly not least, Hallows' Eve. This addition is something I'd been hearing about for months, taking over the spot that was formerly held by Brine Slaughter House, and I was extremely curious to see just how it had been pulled together since the little sneak peek I had gotten a few weeks before opening. Flat out? It does not disappoint, at all. From the moment I set eyes on the facade of the house, I was in love. It's cheesy, chincey, and gloriously tacky in ways that are hard to achieve on purpose. It's that classic Halloween house that we've all seen a million times in our neighborhoods and always kind of sneer at, but if it weren't there? Something would be amiss and lacking. As you approach the front porch, it turns out there's a little party going on inside, and as you can expect, things have gone horribly wrong within this "normal looking house". Around every twist and turn you'll see decorations, costumes, and other signs of Halloweens past that just drive the nostalgia train right through your skull. The details are everywhere and it sells the hell out of the concept on a whole other level. That's just the first part of this though, once you've made it through the house, there's even more to behold. Vampires, werewolves, giant mutated monsters, mummies, the lot of them all call the second half of Hallows' Eve home. It's an insane love letter to all things Halloween and it's done with a masterful stroke. Of course, it's with the signature Hundred Acres Manor spin but that just makes it all the better. It's packed with stunning unexpected details and scares that you won't see coming around every corner. Don't linger too long though, you never know who or what will be lying in wait to claim you as its next victim. I was tempted to just stop and stare at all of the little things going on, it's so much to take in and you can easily miss some of the more fun little Easter Eggs that are hiding about. You'll want to move in, assuming you don't mind the smell of dead bodies and candy mixing together that is. There's so much to say, but I'd be here forever talking about it. Just know that you need to see this if you can, it's really that special. So, what's the final verdict? While a couple things were rough around the edges, it was the opening night and I expected such but it was nothing that would change my view nor the rating given. Yes, The Breach was a little off here and there, and I do think they missed an opportunity with tying it into Hallows' Eve a bit more fluidly, but overall it wasn't something that changed my enjoyment of things as a whole. Outside of that? It's all Hallows' Eve on this one and raises the bar entirely. Between it, and the rest of the place? 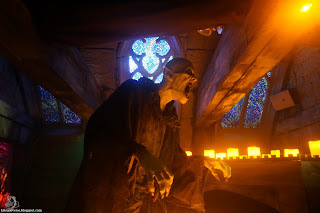 There's no question that once more Hundred Acres Manor gets the rare excellent rating. Though, at this rate, it's not exactly rare for these guys to get it year in and year out. 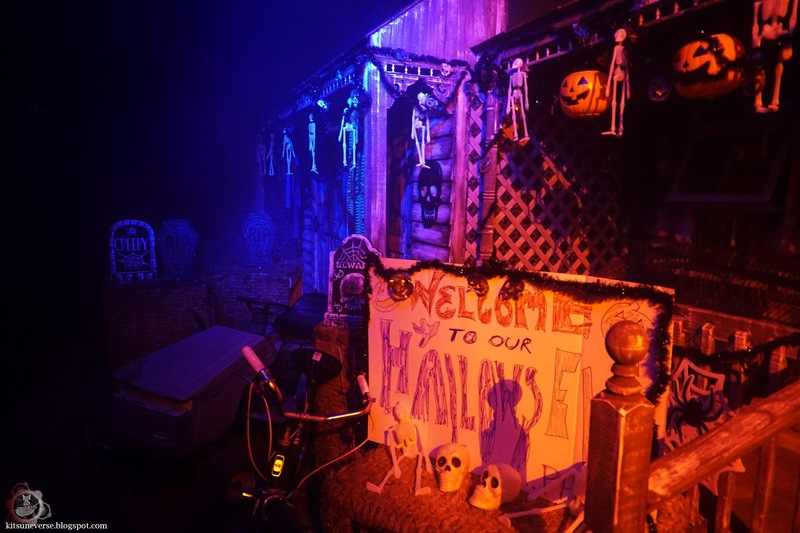 Hundred Acres Manor is open from now through November 1st and there's plenty of nights to get in on the madness. So, hit up their official website to purchase tickets, get directions and all other kinds of useful such things! Convention Travel List for 2019!